February 2017 - Email addresses updated. These procedures outline the handling of contractual arrangements, recording, collection and reporting of monies owed to the University. These procedures apply to all staff involved in University accounts receivable/trade debtor activities. These procedures do not relate to research debtors administered by the Contract and Grants Accounting section of FBS . 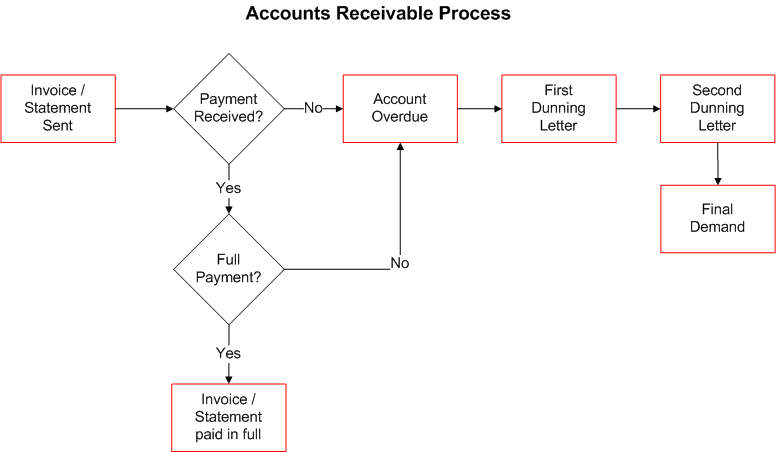 A receivable is money owed to the University for goods or services purchased on credit. Receivables are trade receivables, which are sales to regular trade customers that have been completed but not yet paid for. All University debt is administered through the University's finance systems. Prior to providing any work or services that will result in a material debt by a potential customer to the University, the organisational unit performing the work or services must perform a credit check on the customer to ensure that the likelihood of a default is minimised. The granting of credit to an individual or organisation must be based on a reasoned judgement as to their credit worthiness. Cost effective procedures must be employed to ensure collection of all accounts receivable in a timely fashion. Such procedures may include due legal process where applicable. Finance Officers are responsible for raising invoices for the organisational units in which they are employed via the UniFi  billing module. Finance Officers are to only raise invoices after the goods or services have been provided, not before. Where goods and services are provided under contractual arrangements, invoicing should be performed on an ongoing basis. The University raises invoices for the sale of goods and/or services to external organisations and individuals. This is done in UniFi , except where an organisational unit has prior Chief Financial Officer’s approval to use another financially acceptable system for the recording of debt. The UniFi  AR module is used to record monies owing from organisations and individuals, where the University has provided goods/services on credit. Where an organisational unit provides goods and/or services to another internal University organisational unit an invoice MUST NOT be raised through the billing module. The policy and methodology for Internal Service Charges (ISC) is outlined in PPL 9.40.01 Purchasing . A number of steps must be completed before any work is performed by the organisational unit. These steps consist of obtaining a purchase order and identifying if the customer possesses an account in UniFi . If the customer does not have a UniFi  account the Finance Officer of the organisational unit must submit to ar@fbs.uq.edu.au  a New Customer Checklist . Please note, this form is an internal University document and is not to be sent to the customer for completion. Once the AR unit has received the form the application process commences and only once the customer’s account has been created in UniFi  can the service be performed or the goods provided. Finance and Business Services has approved two (2) methods for University staff to request the creation of a bill in UniFi . Where a University staff member requires an invoice to be raised for goods sold or services performed an Invoice Request Form  must be created, approved by a Financial Delegate, and passed on to the Finance Officer for the creation of the bill. The Invoice Request Form  must be retained on file for auditing purposes. An organisational unit may use an Invoice Request Stamp  in lieu of the Invoice Request Form. Where a University staff member requires an invoice to be raised for goods sold or services performed, a Pro Forma invoice is created. The Pro Forma invoice must be stamped, using the Invoice Request Stamp , and approved by a Financial Delegate. The stamped Pro Forma invoice must be retained on file for auditing purposes. Billing training must be completed by a staff member before being given any access to the UniFi  Billing Module. Refer to the Billing Training Module  on Blackboard  for additional information. The UniFi  billing module should be used for the raising of all bills, excluding where known exceptions exist. Bills should be raised for amounts over $200.00. It is recommended amounts of less than $200.00 should be paid via cash or credit card facilities; if either of these methods is used, a tax invoice/receipt will be provided through OneStop  once the funds have been receipted. The tax invoice/receipt will contain the details of the transaction and is a tax invoice for GST  purposes. This practice is accepted by the ATO  for payments of up to $1,000.00. Organisational units are responsible for raising their own bills on or before the next working day after goods have been supplied or services rendered to a customer. For bills raised in the UniFi  billing module, a daily update to the general ledger ensures the University’s revenue accounts are up to date. For invoices created via other means the revenue is only recorded once the invoices have been paid. In UniFi  bills can be raised in foreign currencies where required by contracts or agreements between University organisational units and their customers. Any such bills are converted to Australian dollars by UniFi  when the revenue distribution is recorded in the ledger. The distribution of bills is handled centrally by UniFi  and occurs once bills have been raised and marked ready for dispatch. The dispatch occurs four times a day: 10:00 am, 12:00 pm, 4:00 pm and 6:00 pm Monday to Friday (excluding public holidays and the Christmas period). Invoices are dispatched via email or in the post according to the customer's preference in UniFi  for receiving invoices. All new customer contacts in UniFi  are set up with invoice dispatch set to email. Organisational units may choose to print a pro forma invoice copy of any invoices they raise; however, this is not an official University document and cannot be sent to a customer for payment. Instead of producing pro forma invoices a Finance Officer may elect to run a Billing Summary Report which contains the invoice information. In UniFi  attachments can be sent to customers along with their invoices. These attachments are supporting documentation which must be uploaded onto the invoice in UniFi  prior to the invoice being dispatched. Attachments are to be a maximum size of 10MB and in PDF format only. If the customer is paying by mail or in person: a copy of the invoice along with the payment should be presented or sent to the University Cashier. If the customer is paying by credit card: credit card payments can be made online at https://payments.uq.edu.au/OneStopWeb/indexlist.html ; in person at the University Cashier or by calling Accounts Receivable on 3365 3209. Where the customer uses the BPAY option: the Biller Code and reference number shown on the remittance advice are to be used. Note that the reference number changes every time a new invoice is created. Where the customer uses the EFT option: a remittance advice must be emailed through to cash@uq.edu.au  to help identify the payment. The University accepts partial payments for invoices via the same payment methods outlined in section 8.1 above. 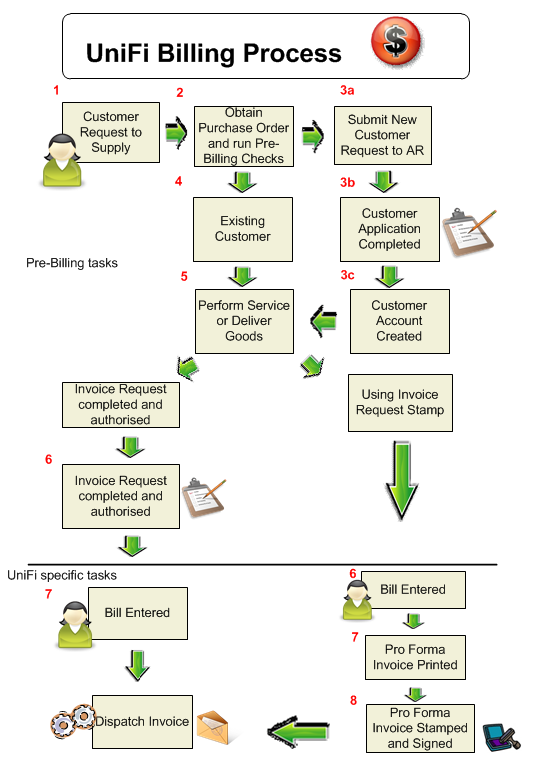 If a customer refuses to make payment due to a dispute over the invoice, or the service provided, or for any other reason it is AR’s responsibility to follow up the disputed invoice(s) within two (2) weeks. It is also a requirement that a conversation is placed on the customer’s account advising which invoice(s) is (are) in dispute and the reason for such a dispute. Each organisational unit is responsible for obtaining a report listing the outstanding invoices which have been raised by the Finance Officers within that organisational unit. This report (Ageing Detail by Billing Unit) is to be run on a regular basis. Where a University staff member requires an adjustment note created as the original invoice is incorrect in some way, an Adjustment Note Request Form  should be completed, be approved by a Financial Delegate, and passed on to the Finance Officer to create the adjustment note in the billing module of UniFi . The Adjustment Note Request Form  must be retained on file for auditing purposes. The University distributes, at the beginning of each month, a statement of account to each customer that carries an outstanding debt in UniFi . These debts are also actively monitored and pursued by the AR Credit Control Officer. Once an invoice has been unpaid after 120 days AR will contact the organisational unit that raised the invoice to determine the appropriate action. In some instances the next logical step is to refer the debt to an external collection agency for follow up action. In other cases there may be a decision to write off the debt. Heads of organisational units do not have the authority to write-off debts. Only certain officers of the University have the appropriate delegation level to authorise the write-off of uncollectible debts. Refer to PPL 1.10.02 Financial Delegations  for authorisation limits. In order to affect a write-off of an unpaid debt, the organisational unit should work with the AR team to identify that the customer is bankrupt, in liquidation or is otherwise unable to make payment. A written request via a Request for Bad Debt Write-Off Form  is to be prepared and forwarded to AR for consideration and processing. It is important that all information pertaining to the debt e.g. contacts, purchase orders, and/or email correspondence is appended to the form before AR can apply to have the debt written off. Where the University’s collection agents advise that it is no longer cost-effective to pursue the debt. When a debt is written off a charge equal to the amount of the debt will be made against the organisational unit's equivalent chart string. When, after a debt has been written off, a debtor becomes solvent, or is traced to a new address, the debt is reinstated to current files and the debt collection process re-activated. Such account reinstatement remains constantly under review, and is supported by search advice from the University’s debt collection agency. A University staff member is not authorised to inform a debtor that action has been taken to write off their debt. A register of debtors whose debt has been written off is maintained by the AR unit. The register records the details of the debt, the authority for write-off, and any subsequent action to reinstate the debt. All bad debtors are to be refused further services by the University, until such a time as the debt no longer remains outstanding. Payments out of the University bank account, such as refunds, must be approved by a signatory in Finance and Business Services. All refunds must be submitted to Accounts Receivable on a Refund Request Form . Refunds sent to Accounts Receivable by email will only be paid once the original has been received. This is to eliminate duplication. Refunds may take up to 2 weeks to process. Care should be taken to ensure that the monies being returned are refunded to the original payer, after perusal of the correct payment source. If a refund is to be paid to someone other than the original payer/name on the receipt the Refund Request Form  must be supported by a letter or email from the original payer/name on the receipt confirming the reason for payment to someone else (e.g. receipt is in a student’s name, but the refund is to be paid to a parent). Refunds to someone other than the original payer may not be approved in all cases. For example, if UQ is paid in error and the payer requests the fund be forwarded to another organisation, the request will be denied and the funds will be returned to the original payer. If a refund cannot be made to a client for any reason, then an application is to be made by AR staff to the Chief Financial Officer to transfer the credit amount to central University funds. If large numbers of refunds are to be made at any one time contact AR via email address: ar@fbs.uq.edu.au  to discuss the best option for processing. The refund form is to be authorised by a Financial Delegate in accordance with PPL 1.10.02 Financial Delegations  and returned to the AR unit for processing. If the required information is not supplied, forms will be returned immediately to the organisational unit for correction and processing will be delayed. Where an invoice has been overpaid, the customer/client must request a refund in writing to ar@fbs.uq.edu.au . The customer must also provide proof that a double payment, overpayment or payment error has occurred; this may include a copy of a bank statement or copies of remittance advices. Large credit accounts are referred by the AR unit to the organisational units concerned to ascertain whether the clients in question are likely to receive further services from the University, if not, a refund may be arranged. If however, a customer has overdue debts it is at the AR unit's discretion to decide whether the refund may or may not be processed until all debts are settled. Where invoices have been overcharged and then paid by the customer/client, an adjustment note must be created in UniFi  and a Refund Request Form  completed by the organisational unit, both of which need to be forwarded to the AR unit for processing. Attached to the back of the Refund Request Form  must be the customer's bank details provided on the customer's letterhead. The form must contain the details of the original payment, amount and date(s) of payment and reasons for refund, as well as the adjustment note number to be refunded. If there is insufficient space on the form to record all of the required information, please attach a schedule for this purpose. For general refunds where no invoice was created and the deposited funds were applied to a University chart string please complete a Refund Request Form . Evidence of the original payment must be attached. The chart string recorded on the form should be the one to which the original monies were credited. If GST  was included on the original payment, it should also be included on the refund and the split should be reflected in the chart field section of the Refund Request Form . Sufficient information should be included in the "Reason for Refund" field of the form to enable to the recipient of the remittance to identify the reason for the return of funds. Refunds of Security Key Deposits, Swipe Card Deposits and Slide Box Returns up to a value of $50.00 can be paid out of Petty Cash but must be approved by a School Manager or Senior Administrative Officer. Once the Key, Swipe Card or Slide Box has been returned from the student/staff member, a Petty Cash Refund Form should be completed. Attach the original receipt and submit the form to a School Manager or Senior Administrative Officer for approval. Once the Petty Cash Refund Form has been approved, obtain a signature from student/staff member receiving the refund and the cash refund is then issued by the organisational unit receiving the Key, Swipe Card or Slide Box. These forms are not to be sent to any Central Cashier (St Lucia, Gatton or Ipswich) or the Student Centre. If the original payment was received via credit card or no Petty Cash facility is held within that organisational unit, a Refund Request Form  must be completed and sent to Accounts Receivable for processing as per PPL 9.35.01b Section 12 . Evidence of the original payment must be attached. The normal reconciliation and reimbursement procedures apply to Petty Cash facilities. NB: Petty Cash refunds should only be issued to the original payer, to comply with our audit requirements. The AR unit is responsible for reconciling the outstanding debtors listing from the AR module of UniFi  to the general ledger. The reconciliation must be performed as part of the month end process and should be reviewed at least on a weekly basis.